Picking the Best Coffee Table For a Sectional With a Chaise + Reviews! When you are planning on redesigning your living room, you really need to put a lot of work into if all the pieces will work together in a fluid and natural manner. That being said, it can be extremely difficult to match a new coffee table with your sectional, especially if it has a chaise. That being said, after remodeling quite a few rooms, and always being available to help my friends remodel their rooms, I have gotten quite the eye for picking the right pieces to work together. In this article we will be discussing my favorite picks for the best coffee table for a sectional with a chaise. There are many different designs of coffee tables, and they all vary in size, color, shape, so it can be difficult to to select tables that go with your sectional. That being said, after experimenting with quite a few different ones myself, I’ve been able to narrow down my picks, and come up with some great tables. These tables are extremely high quality and they are extremely practical, and look great! That being said, I hope you enjoy my reviews, and you find a table that you love! The first coffee table on our list is the Sauder 42001 Oak Coffee Table, that has some nice storage featured underneath the table. This Sauder table is one of the first coffee tables I purchased and I loved the rustic design with a large bit of storage as well. Along with this, this table features a unique lift-top design which allows you to lift the top and it presents you with a truly versatile work station with more storage featured inside. I was extremely surprised with this table of just how sturdy and durable it was. The photos don’t necessary do it justice, but it has a nice weight too it and you can just feel that it won’t fall apart on you. That being said, when I ordered this coffee table I didn’t think I would ever use the lift-top feature, but after trying it out once, I was hooked. This lift up top makes it perfect for eating a meal on your sectional, or even using your laptop or writing. Along with this, the color is truly something I enjoy. This table is part of the taupe family and it is extremely versatile with its ability to to match with other pieces. This coffee table is also a great size for most sectionals because of its dimensions. This rectangular table is 19.45 inches wide, 43.15 inches long, and 19 inches high. This makes it a medium sized coffee table that will fit between the chaise and the opposite arm rest. Along with this, the installation of this table is extremely simple, and all the tools are included. I was able to put this table together in about an hour and I am not the most handy. Overall this is an excellent coffee table to fit next to your chaise! If you are looking for a table with a great look to it, along with ample storage space, then this Sauder table is for you! I purchased this table and it’s great for next to my chaise sectional, and the lift-top makes it a great addition to your living room! The next coffee table for next to a chaise on our list is the Mango Steam clear glass coffee table. This is a rounded table that is great for braking up straight lines on your sectional. This coffee table is simpler than the previous table, but it also has an extremely elegant design to it. This table comes in three different color styles, one being a black top with a black base, and the other two being glass tops with a silver base and a black base respectively. These options give you some choices for your living room, and I think they all look great! Compared to the previous Sauder coffee table, this circular Mango Steam glass table is a little bit smaller with a dimension of 33 inches wide, and 19 inches high. This makes it a great choice for smaller chaise sectionals that are looking for a simple end table to place books, or food. One downfall of this coffee table is that it doesn’t have any storage space like the other table, but that isn’t part of its elegance. This table is extremely sleek and it is extremely practical. 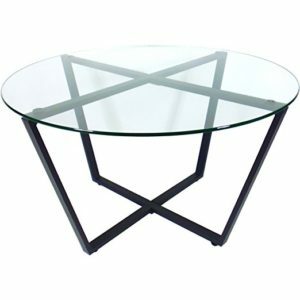 This tempered glass table is great if you are looking for a touch of modern design in your living room without it feeling too substantial. Along with this, the glass is extremely thick and durable and you shouldn’t have to worry about it breaking if you are using it how it was designed to be used. This table also has the benefit of looking a lot more expensive than it actually is, this piece looks like it would cost a small fortune, but thankfully it is quite reasonable. Overall if you are looking for a coffee table that features a more modern feel next to your chaise sectional, then definitely look at this Mango Steam tempered glass table. It provides you with the perfect coffee table to fit next to your chaise and help to break up the straight lines, while providing you with an extremely stylish and practice table. If you are looking for a circular coffee table next to your sectional, then this is the one to look at! When you already have a chaise sectional, or you’re looking to redo your whole living room, you want pieces that will match. Although this can be a difficult task, it’s not impossible. When it comes to matching a chaise sectional and a coffee table there a few guidelines that you should follow to ensure both practicality and looks. That being said, I have compiled a few tips to make sure you stay on track while picking the best coffee tables. When you are looking for a coffee table to fit in front of your chaise sectional, it can be difficult to judge the size needed. Upon initially research it can be easy to pick a sectional that is way too big or way too small, and that is why it’s important to measure your sectional before you look at tables. When you are measuring your sectional, you want to find the distance from the inside of the chaise to the opposite arm rest, and this is the width that you will not want to exceed. If you have a coffee table that is wider than your sectional it will take up more space than needed, and it will look off center, and out of place. That being said, if you a large chaise sectional, then you will need a large coffee table. Along with this, you need to be cautious of the height of your coffee table as well. When you are selecting a table you want the height of the table to be about 1 or 2 inches shorter than the height of the sofa seat cushion. This ensures that you not only will be able to reach the table easily, but it also at a good height for your feet. Another tip that I learned can be extremely helpful when choosing the right table is to pay attention to angles and shapes. If you have an extremely sharply angled sectional, it can be wise to mix up the angles with the coffee table. For example, if you have a sharply angled sofa, then throwing in a rectangular coffee table might just add to the over abundance of straight lines. In this situation you could think about getting a rounded table to help break up the lines in your living room. Another great thing about coffee tables is that they can be featured with extra storage space below the table, which is a great thing for any living room. There are quite a few different storage designs available, some that are under the table, some that have bookcases on the sides, and a few other options. That being said, having extra storage space next to your sectional is a great idea! As mentioned prior, it can be a difficult process picking the correct coffee table for next to your chaise, but once you know the tips, then it definitely gets easier! That being said, if you select any of the tables reviewed above, then you don’t have to worry about quality or durability because they all are extremely great products! Overall, I hope you have enjoyed our buyers guide, and you have found the right table for you and your home!